Sign up for our newsletter below to be notified of upcoming Tulum Retreat dates and other locations! Hosted by Yoga with Singer, you will spend 5 days and 4 nights for a long weekend exploring the town, beaches and food of Tulum. Our retreat will start off with a 60 min yoga class on Thursday (by 4:30 or 5pm) followed by a complimentary smoothie or cocktail by the pool. Enjoy your first dinner at the hotel restaurant or head to the beach for the sunset and other dining options! After our daily morning garden yoga sessions at our small boutique in-town hotel, you will be able to choose your own adventure. Cost includes 4 nights lodging, private transfers to and from Cancun airport, 6 yoga classes, hotel taxes, daily housekeeping and more. April is considered the best weather in Tulum with little to no rain and an average high of 79-84 degrees. 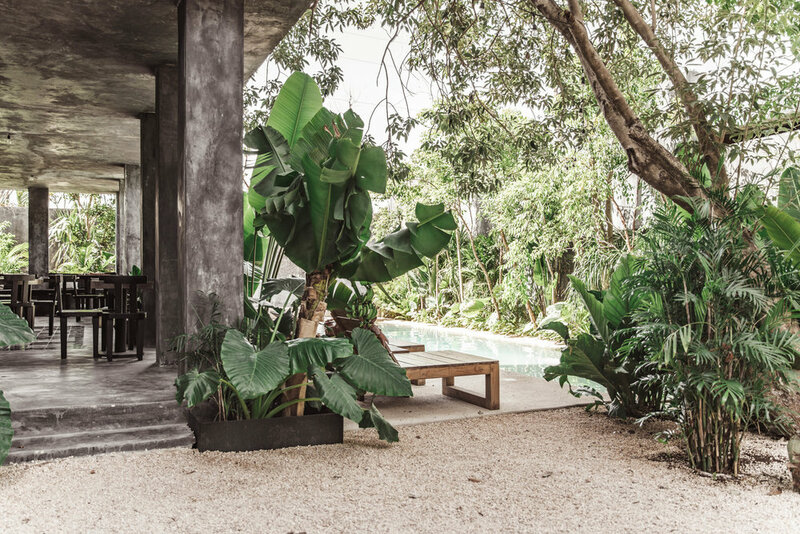 Welcome to our one-of-a-kind boutique hotel in Tulum, Mexico. At the nexus of tropical bohemianism and clean urban design, the hotel offers a host of features, from fresh dining options, to a sparkling pool, an organic coffee shop, and 16 beautifully appointed rooms. This retreat is for those who like to have adventures and to come home to a clean, calm room at the end of a day. Our hotel features an open kitchen restaurant. It’s the gathering place where everyone will feel at home. Serving brunch all day and transitioning into dinner by night, offering a menu that is clean, modern, fresh and soulful. Singer will also have a list of highly rated eating options for yogis to explore during the weekend! 4 morning + 2 afternoon or evening yoga sessions (6 total) with Singer will take place at the hotel in the walled in garden by the pool or the rooftop! Make sure to bring your own yoga mat for these all-levels friendly, restorative + hatha flow classes. Optional sunrise meditation before class each morning. Welcome Smoothie or Cocktail from our Hotel Bar. We will collect your flight arrival and departure times at least 30-60 days before the retreat. Late arrivals at the airport or early departures will include an additional transportation fee* It is a 1.5-2 hour drive from Cancun to Tulum. Book your flight to arrive at the Cancun airport between 9am-1pm on Thursday. Book your departure flight for between 3pm-5pm or later on Monday. Currently 7 attendees are on these flights with Southwest Airlines! Email Singer if you have questions on flights. These flights arrive in Cancun at 8:40am on Thursday, depart at 4:55pm on Monday. 2 other attendees are flying in from New York on Delta, arriving at 12:08pm and departing at 3:30pm Monday. PRICES GO UP by $100 AFTER FEB 1st! Final Balance Policy: Your Final Payment must be received by March 1st, 2019, and all payments are non-refundable after this date. Cancellation Policy: In the event of cancellation, 75% of your entire payment will be refunded less the $500 non-refundable deposit and a $50 processing fee if the cancellation is made before February 1st, 2019. Payments are non-refundable after this date. Check in to our retreat hotel is at 3pm - this is when our Retreat officially begins. Yogis arriving before this time will have lunch/brunch at the hotel before we can check into our rooms. Check out is by 12pm on Monday April 15. Arriving at the Cancun airport between 9am-12pm on Thursday would be great. *Please do not book a departure flight for earlier than 12pm or 1pm on Monday (preferably closer to 4 or 5pm departure to match up with others already booked). We will have rides arranged for everyone from the airport. The drive will take around 1.5-2 hours from the airport. Please plan to BRING YOUR OWN YOGA MAT & BEACH TOWEL.